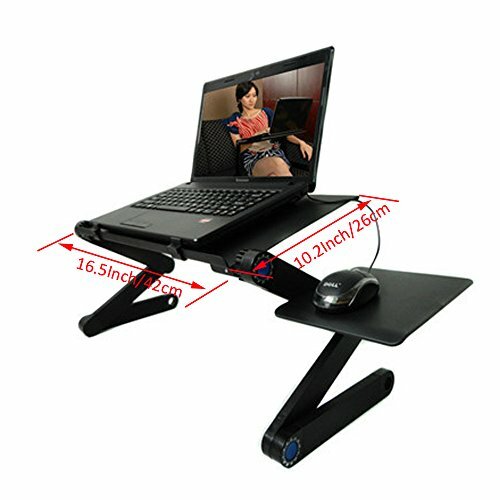 This desk will hold your computer firmly with the front edge and 2 slide-proof ABS clips. The additional side tray is great for use as a mouse pad or to hold your coffee. 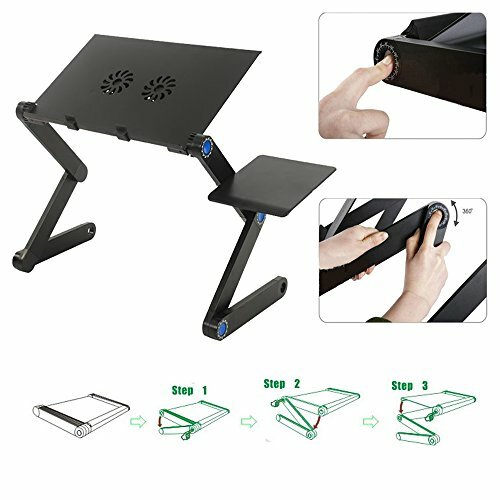 Multi-functional adjustable laptop stand that can also be used as TV dinner tray, sound equipment table, projector table, standing desk platform, standing desk, sit-stand desk, book tray, writing desk and tablet holder. Suitable for all notebook and laptop brands, Ultrabooks, MacBook, MacBook Air, Chromebook up to 17" in screen size. 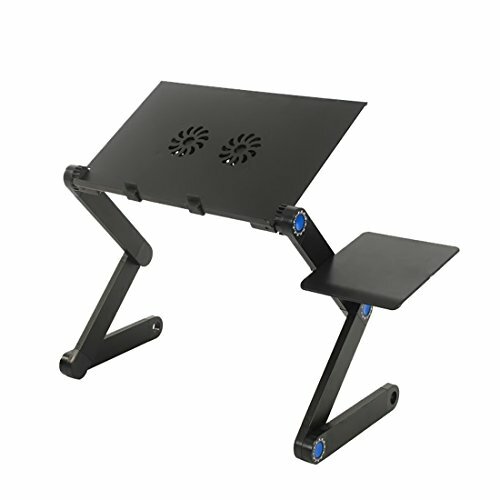 This Bluewo Adjustable Laptop Desk makes a thoughtful gift for friends and family that rely on their electronic devices. -Package Dimension: 21.2" x 10.6" x 1.8"
-Removable mouse board 6"x 5"
Made of lightweight strengthened aluminum alloy for firmness and stylish look. Highly functional with multiple uses - 6 extraordinary locking button can be set in full 360 degree angles to fit any body position, even laidback on your bed. Silent built-in fans - cool your laptop on USB power. The height can be adjusted to full height of 19 inches depending on your bed position or sofa position. Front edge with 2 slide-proof ABS clips to keep your laptop secure. Folds flat for space-saving storage and portability. Folded Dimension: 20.8"x 10.2"x 1.6"
If you have any questions about this product by Bluewo, contact us by completing and submitting the form below. If you are looking for a specif part number, please include it with your message.